It comes as no surprise that Sydney Pollack’s Amazing Grace is 87 minutes of sheer excellence. 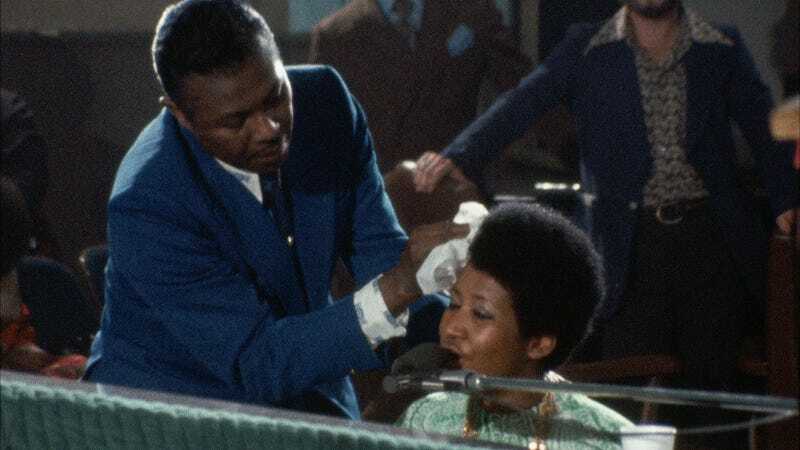 The long-lost movie captured the recording of Aretha Franklin’s landmark 1972 live gospel album Amazing Grace and remained unreleased (due to sound issues and then litigation on the part of Franklin) until its Monday premiere at the DOC NYC festival. Amazing Grace is not so much a documentary as a concert film, and not so much that as a religious experience. We’re given very little background, just some title cards that explain the situation and Franklin’s career trajectory, and then later, a few interspersed shots of Franklin rehearsing for the two-night recording at the New Temple Missionary Baptist Church in Los Angeles, where she was backed by the Southern California Community Choir. We have very little indication of what it took to prepare for such an event—Rev. James Cleveland presides and does almost all of the talking between songs. He sometimes describes their makeup (the pop/gospel mash-up of Carole King’s “You’ve Got a Friend” and Rev. Thomas A. Dorsey’s “Precious Lord Take My Hand”), and elsewhere indicates how they went down in rehearsal (he describes Franklin’s tears while practicing “Amazing Grace”). This is primarily a kinetic portrait of life in the moment during those two nights in that church. Pollack and his five roving cameras are clearly attempting to soak in as much as possible. They succeed, for the resulting film is positively saturated—saturated with color in that almost sickly ’70s way (see how the royal blue of the church’s carpet and seat padding contrasts with the robin egg blue of the walls and ceilings), saturated with spirit, saturated with sweat that pours off of the gathered congregation, off Rev. Cleveland, and off Franklin. By the third song presented from the first night, the rollicking “How I Got Over,” Franklin’s forehead is speckled with droplets of sweat, a cosmetic side effect of her musical vigor. They’re indistinguishable from the dots light beaming off of her bedazzled dress onto her chin above. The closeup shots of her perspiration are so intimate they almost feel invasive, and yet Franklin’s mystique remains preserved throughout. After Rev. Cleveland introduces her to the congregation the first night, she takes the piano and performs her take on Marvin Gaye’s “Wholly Holy,” her eyes closed for much of the performance, her light-blue eye shadow beaming in the absence of her gaze. For the entire duration of the movie, she’s seen saying only a few words to the crowd (at the conclusion of her second night performance, to thank them for coming out); here, she allows the music to speak for itself. And what a story it tells. Her voice is a constantly evolving wonder—it keeps going higher, and pushing harder than you previously thought possible so that she keeps you in a perpetual state of having your mind blown. It’s so strong, yet controlled, so sweet yet pained, so human yet so impossible. There’s just no rational explanation for her multitudes—yes, she was trained in the church; yes, she had the privilege of knowing preceding gospel greats like Mahalia Jackson and Clara Ward and absorbing their influence firsthand; and yes, her father, C.L. Franklin, was a celebrity Baptist minister. But all that merely pointed her in the direction. Beyond that, it was something innate, something even as a nonbeliever I feel compelled to refer to as a God-given gift that she was a genius at using. If Franklin’s September death upset you, watch Amazing Grace and prepare to be devastated all over again. When Franklin left the earth, she took so much talent with her. But she also left behind a great legacy whose peak is captured in Amazing Grace. Though lacking a conventional narrative outside the individual songs, the film initially situates Franklin as its focal point only to slowly pull back to capture how her music affected the crowd. Pollack establishes her as a star and then reveals her status as a conduit, a servant of the Lord. The film’s overflowing cup of the joyousness of black people serves as a reminder as to how infrequently such celebrations have been portrayed in mainstream pop culture. The second night’s congregation includes Ward (who strides down the aisle in a fur and bedazzled dress), her father C.L. Franklin (he eventually speaks a bit from the pulpit between songs and wipes the sweat off his daughter’s brow as she plays “Never Grow Old” on the piano), Mick Jagger (who claps and dances like he wants everyone to think he k nows what he’s doing in that black church), and plenty of non-famous people who are visibly moved by Franklin’s invocation of the Holy Spirit. They clap, they dance in the aisles, they sing along. The film’s overflowing cup of the joyousness of black people serves as a reminder as to how infrequently such celebrations have been portrayed in mainstream pop culture. In that way, this film was ahead of its time, and arriving today, some 46 years later, feels right on time. He talks of how she spent years singing with Rev. Cleveland, how her “uncanny ear” allowed her to pick up many of Cleveland’s established techniques. He tells a story about picking up his laundry and hearing from the woman who worked at the cleaners say that she saw Aretha performing one of her secular songs on television the night before. By this time in 1972, Franklin had cemented her title as the Queen of Soul with a string of hits (like the legacy-defining “Respect” and “Chain of Fools”) on both sides of the pop and R&B divide. She could have easily coasted, but made the audacious choice of returning to her roots with this project. “I’ll be glad when she comes back to the church,” C.L. Franklin recalls the woman saying. “I said, ‘Listen baby, let me tell you something,’” he continues, laughing. “‘If you want to know the truth, she had never left the church.’” The audience applauds. Aretha continues saying nothing, because by then she’d already proven her father’s point and then some.